Australian Open associate partner ANZ is associated with the tournament by nearly two million Australians equivalent to 10% of the population. Leading sports apparel companies Adidas and Nike – who both personally sponsor several leading tennis players – are associated with the Australian Open by 9% and 8% of Australian respectively. Nearly a third of Australians who play tennis associate Kia (32%) with the Australian Open and 19% associate ANZ with the tournament. 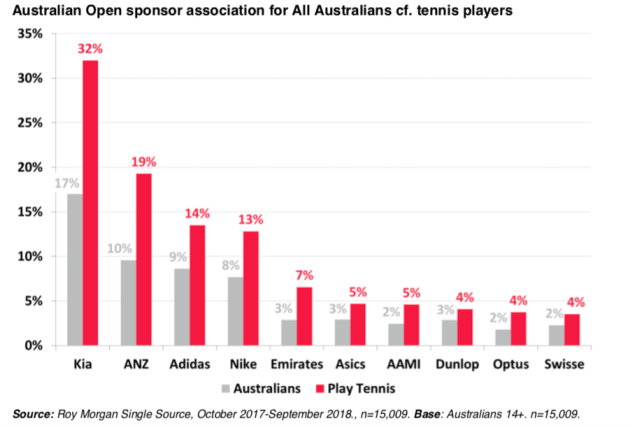 Once again sports apparel companies Adidas (14% of tennis players) and Nike (13%) are regarded by many tennis playing Australians as being associated with the tournament while official sponsors Emirates (7%), Dunlop (4%) and Optus (4%) are also widely associated with the Australian Open by those Australians who play the sport. Interestingly, the Roy Morgan study does not mention Uber Eats, which was also a sponsor and caused a stir with its bold advertising strategy after it integrated its brand into live tennis action. Kia had both on-site and off-site locations at the event with a pop-up activation that allowed fans to test their 'Caraoke' through augmented reality with Thanasi Kokkinakis and Daria Gavrilova. For the first time, the brand spread outside of the grounds with live sites in Federation Square and test drives at Southern Cross Station. Analysing brand association for leading Australian Open Major Partner Kia shows that whether someone recalls Kia’s association with the Australian Open is heavily dependent on their personal involvement with the sport of tennis. Nine recently told AdNews the Australian Open had "exceeded all expectations" reaching more than nine million viewers and with attendance improving on the previous year. Naomi Osaka and Novak Djokovic may have been the winners of the Australian Open, but it's Kia that struck advertising gold with its sponsorship of the tennis tournament. A report from Roy Morgan has found nearly 3.5 million Australians associate Korean car company Kia with the year’s first Grand Slam tournament. That is equivalent to 17% of the Australian population aged 14 or older. The statistics prove Kia benefited significantly in brand awareness from its major sponsorship of the Australian Open.